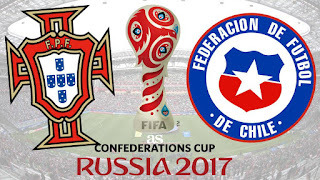 UEFA Euro 2016 winners Portugal take on Copa America champions Chile in the semi-finals of the 2017 Confederations Cup on Wednesday, June 28th, 2017. Two superstars, Cristiano Ronaldo and Alexis Sanchez will do battle in the Kazan Arena, Russia, as the nations fight for a spot in the final. Either Mexico or Germany await the winners in the game to decide the championship. La Roja limped past Australia to claim second spot in Group B in the final match of qualifying, as A Seleccao topped Group A on goal difference over Mexico. Talented Bernardo Silva missed training ahead of the last-four game after picking up a knock. Silva has impressed for the Portuguese during their time in Russia, and it is clear he could develop into major star for Manchester City after signing for the Premier League side from Monaco. Ronaldo remains the central threat for his team after scoring twice in the tournament, but Portugal have a wealth of creative talent available to support him. Chile appeared quiet against the Socceroos in their final group match, but they produced a solid second-half performance to qualify. The form of Sanchez will be key against the Portuguese unit, and his ability to penetrate the defence could decide the outcome.